Don't be afraid to break branches and make noise as you walk. Moose are big animals and make a lot of noise when they are walking so when calling try and make the same noises they do as they are walking. 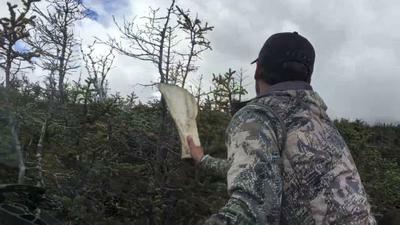 Another great moose hunting tip! Moose can make some big noises when traveling through the woods. Breaking branches, antlers knocking on trees thrashing bushes are all noises that a moose can make that are natural to the environment. That being said, when trying to mimic moose noise don't go overboard. As big as moose are, they can also move through the bush without making a sound. If you have ever been calling moose and had one "appear" as if out of thin air you'll know what I mean.